锥体系由上、下两级神经元构成，上运动神经元胞体位于大脑皮质内，下运动神经元胞体位于脑干或脊髓内。 Cone system consists of upper and lower levels of neurons, the motor neuron cell bodies located in the cerebral cortex and lower motor neurons in the spinal cord or brain stem. 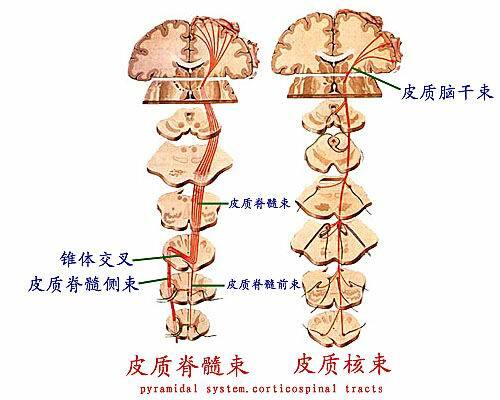 锥体系包括皮质脊髓束和皮质核束。 Cone system includes the corticospinal tract and the cortical nucleus beam. 胞体位于中央前回，其纤维组成皮质核束下行至脑干。 Cell bodies located in central gyrus, the cortical fibers nuclear beam down to the brainstem. 胞体位于脑干的躯体运动性脑神经核，其纤维组成脑神经。 Cell bodies in the brain stem of the body movement of cranial nerve nuclei, the fiber composition of the brain. 胞体位于中央前回，其纤维组成皮质脊髓束，经内囊后脚下行至延髓形成锥体，大部分纤维交叉后形成皮质脊髓侧束，少部分未交叉纤维形成皮质脊髓前束。 Cell bodies located in central gyrus, the fiber composition of the corticospinal tract, after the internal capsule at the foot of the line to the medullary cone formation, the formation of lateral corticospinal tract after most of the fiber cross, uncrossed fibers form a small part of the corticospinal toe. 是位于脊髓的前角运动神经元，其纤维参与组成脊神经，支配骨骼肌。 Is located in the anterior horn of the spinal cord motor neurons, and its participation in the composition of the spinal nerve fibers, the dominant skeletal muscle. 锥体外系主要是指锥体系以外的、控制骨骼肌运动的下行纤维束。 Extrapyramidal system mainly refers to the cone outside the control of skeletal muscle fiber bundles downward movement. 主要功能是协调肌群运动，维持肌张力，协助锥体系完成精细的随意运动。 The main function is to coordinate muscle movement, to maintain muscle tone, help complete the fine pyramidal system of voluntary movement.